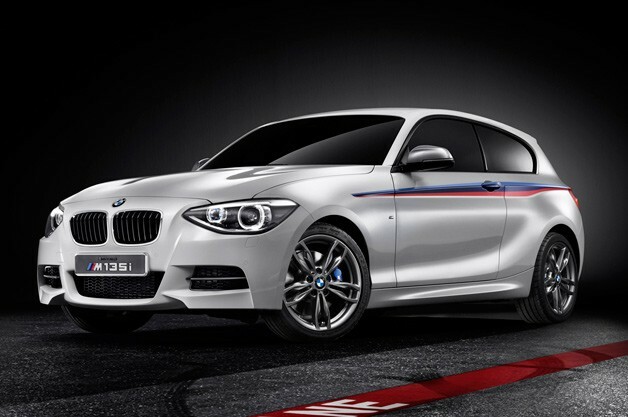 Mechanic Girls: BMW M135i Concept blends turbo heart with three-door hatch shell. BMW M135i Concept blends turbo heart with three-door hatch shell. And here we thought we already knew about everything BMW planned to bring to the 2012 Geneva Motor Show. We were wrong. The German automaker has announced that it will debut a new M135i Concept, marking the first time it has paired a gasoline-burning engine with its new M Performance moniker. We'll get to the powertrain in a moment, but first, take note of the three-door hatchback body. Up until now, we've only seen the 2012 1 Series in five-door form, and while the M135i is officially a concept, we'd expect the production version to rock this basic shape, sans the enlarged air intakes up front and the rest of the body kit. BMW says the three-door 1 Series has "a more dynamic and elongated appearance" than its five-door sibling, pointing to details like its rising character line, frameless windows and "powerfully flared wheel arches" as unique elements. We won't argue any of that, but we're still not entirely sold on the new 1er's nostrils. Underhood lies BMW's well-known Twin Power Turbo 3.0-liter inline six that sends "more than 300" horsepower to the rear wheels. The suspension has been modified for M Performance duty, and the wheels have been upgraded to 18-inch M-branded alloys. We expect something along these lines to show up in production guise in relatively short order... at the very least for European buyers. Check out the high-res image gallery above, then click past the break to read the official press release.